The tenants of Burlington's Bobbin Mill Apartments got the word three months ago: Come July 1, according to a flyer affixed to every door in the complex, marijuana would be legal in Vermont. But as occupants of federally subsidized housing, they would remain bound by U.S. law that prohibits cannabis use. "You cannot smoke marijuana, grow any plants or possess any amount of marijuana ... even if you possess a medical marijuana card," read the notice from Burlington Housing Authority. "State laws that legalize marijuana directly conflict with" federal regulations and could result in eviction, it added. The regulations and potential penalties were no surprise to Fox Grey, who is a medical marijuana patient. But she said she was "absolutely livid" that BHA appeared to be cracking down on the poor, disabled and elderly people who rely on government-subsidized housing — and also on products that contain cannabis. "To sit there and say you're going to kick someone out for using what a doctor is prescribing ... You can't throw some of these people out on the street," she said. Now, "We're afraid in our own homes," Grey said. BHA's stance does, in fact, fall squarely in line with federal law, which classifies cannabis as a Schedule I drug "with a very high potential for abuse and no accepted medical use in the United States." That means that, under regulations set forward by the U.S. Department of Housing and Urban Development, public housing authorities such as BHA are not allowed to accept new tenants who use cannabis for medical purposes — much less those who admit to consuming it recreationally. But HUD policy also lets local administrators decide "on a case-by-case basis" whether to evict an existing tenant who consumes cannabis on the property. These mixed messages — and discrepancies between federal and state laws — have put some fed-funded organizations in a difficult position: Should they strictly adhere to federal guidelines or hope that the authorities in Washington, D.C., have more important things to do? The ambiguity worries Grey. The 38-year-old has Ehlers-Danlos syndrome, a genetic condition that affects the body's connective tissue and, in her case, paralyzed the stomach muscles that aid in digestion. Now wheelchair bound, she's had more than 20 surgeries, including some to insert feeding tubes, since she moved to the Pine Street apartment complex three years ago. Grey got her medical marijuana card last August, shortly after doctors told her that she had only a few months to live. She's unable to eat, except with the help of marijuana, which stimulates her appetite and allows her to keep down a small amount of broth or other food. She applies marijuana as a topical salve or vapes with an oil cartridge pen. Cannabis is "the only reason I'm here," Grey said of her tenuous health. Whether cannabis will also get her evicted remains unclear. 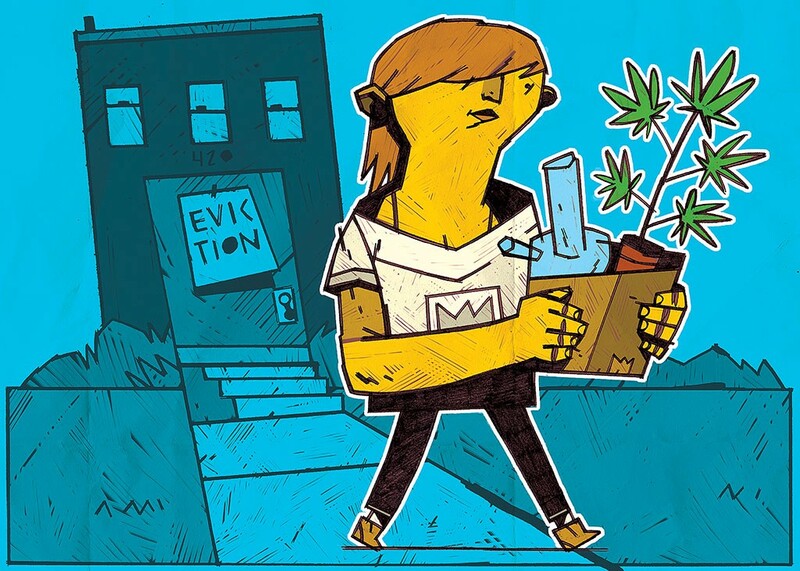 BHA executive director Allyson Laackman said she didn't know whether her organization, which provides affordable housing for about 2,500 families in Burlington and Winooski, had ever taken the step to evict for cannabis use. But doing so would be within its rights, she noted. While the federal Americans with Disabilities Act requires that housing providers give "reasonable accommodation" to those with disabilities — such as allowing a guide dog in a home with a "no pets" policy or permitting a live-in aide — those exceptions don't apply to cannabis because the drug is federally illegal. "We just don't have the latitude," Laackman explained. "We're not opining on what Vermont has chosen to do; we just have to follow the federal guidelines. Our funding is dependent on it." Other housing agencies aren't playing it so safe. Champlain Housing Trust doesn't allow cannabis use at its properties, said chief operations and financial officer Michael Monte, but "We don't go off and evict people for reasons like using marijuana. That's not one of the issues we're working on or paying attention to." If a tenant were selling the drug or disturbing neighbors, CHT would intervene. But if a property manager caught one of the residents simply using cannabis on the property, a written warning would likely be enough, Monte said: "We think of this as 'don't ask, don't tell.'" That's an approach some BHA residents are banking on as well. On a sunny afternoon last week, Sarah Bull pulled out a pipe packed with marijuana, along with a cigarette, to smoke at a picnic table in front of the housing authority's Wharf Lane Apartments on Maple Street, where she has lived for five years. The table wasn't on BHA property, she said as she offered the bowl to this reporter — who declined. "I don't care; the cops don't care" about marijuana smoking, she added. Another cigarette smoker and BHA resident, Robert Houle, said he has a medical marijuana card for fibromyalgia — though, the 49-year-old added, he's been smoking weed since he was 7. When he received BHA's no-pot notice in February, he crumbled it up and threw it out. "It's a catch-22, see?" Houle said of the restrictions. Plenty of Vermont organizations are negotiating that same legal no-man's-land. On January 22, the day Gov. Phil Scott signed the marijuana bill into law, the University of Vermont sent out an email to its students informing them that, even as of July 1, cannabis use and possession — including medical — is prohibited on campus. "The University of Vermont is not willing to risk significant federal dollars, including financial aid money to students, nor risk the health, safety, welfare and educational achievement of members of our community," wrote Wendy Koenig, the university's director of federal and state relations. The same goes for nursing homes where residents rely on the federal programs Medicaid and Medicare. Jessica Jennings, executive director of Burlington Health & Rehab, said the facility does not admit medical marijuana patients. Use inside the building is also prohibited. Such enforcement has the backing of the law, said Jay Diaz, an attorney for the American Civil Liberties Union of Vermont. Federal law trumps state law under the U.S. Constitution, which means that tenants who want to evade prosecution or get reasonable accommodation for medical marijuana will have an uphill battle in court, Diaz said. But, he added, authorities' decision to actually clamp down is about "weighing what the law says now, versus [enforcing it] practically and realistically." Recreational use is legal in nine states and in Washington, D.C., and comprehensive medical marijuana programs exist in 29 states, meaning it's unlikely — and nearly impossible — for the federal laws to be enforced. That could explain HUD's sympathetic-sounding stance. The agency has not "taken any action" against housing providers that aren't complying with federal regulations, said Rhonda Siciliano, public affairs officer for the department's New England region. Officials are helping housing authorities "work through these issues," she said. "There is an understanding that it's complicated." There's no federal legislation currently in the works to address discrepancies between state and national rules, according to Kate Hamilton, press secretary for Congressman Peter Welch (D-Vt.). Meanwhile, Welch "believes that there should be no discrimination against people who use marijuana for medical purposes, including in housing," Hamilton said in an email to Seven Days. Sen. Patrick Leahy (D-Vt.) has gone one step further. His spokesperson, Lincoln Peek, blamed "Trump administration policies" for limiting those living in federally subsidized housing from accessing medical marijuana. A federal spending bill signed into law in March included a Leahy provision that would prevent the U.S. Department of Justice from using federal funds to crack down on people using medical marijuana in states where it's legal. The existing system does disproportionately penalize poor and minority communities, said Laura Subin, the director of the Vermont Coalition to Regulate Marijuana, which advocated for full legalization and a tax-and-regulate system. Middle- and upper-class homeowners will be able to grow and smoke, with none of the restrictions that may fall on renters, particularly those who receive federal subsidies. "We have a patchwork of laws that will disproportionately affect poor people and people of color," Subin said. Some of them, such as Grey, are having to choose between their housing and their health.